It detects metabolic. activity of tumors, also useful for surgical staging as it may detect unsuspected metastases, and useful in deciding which lesions to biopsy vs. follow with serial CT.
2. Transthoracic needle biopsy (TTNB): if technically. feasible, 97% will obtain definitive tissue for diagnosis. 3. Video-assisted thoracoscopic surgery (VATS): for percutaneously inaccessible lesions; highly sensitive and allows resection; has replaced thoracotomy. 4. 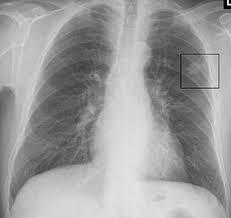 Biopsy: A biopsy of a lung nodule should be performed to determine whether it is malignant. Biopsy of a solitary pulmonary nodule can be performed bronchoscopically or via CT-guided transthoracic needle aspiration (TTNA). • Ground-glass nodules: longer follow up because even if malignant can be slow-growing and PET negative.